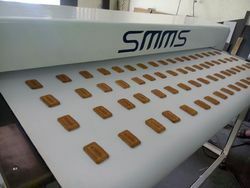 Providing you the best range of conveyorized metal detector for biscuits and noodles with effective & timely delivery. We offer wide range of Conveyorized Metal Detector for Biscuits and Noodles. A specially designed Model for packed food, ready to eat foods, Biscuits, Confectioneries & Frozen Sea Foods. These are Tailor made machines as per various applications. With different types of Rejection Systems.